Castle Rock Hostel kohteessa Edinburgh, Skotlanti: Varaa nyt! Kääntäjä: Castle Rock Hostel on ihanteellisella paikalla aivan vieressä Edinburghin linna, ylös mäkeä Grassmarket. Tämä huolella sisustettu hostelli on siisti, tilava, teemahuoneet että vieraamme ovat kuvattu "ihana ja lämmin", sekä suuri keittiö ja useita oleskelutiloja, joten siellä on runsaasti tilaa tavata toisia tai löytää hiljaisessa nurkassa. Hostelworld matkailijat ovat sanoneet "henkilökunta ovat ihania ja hyvä vastaamaan kysymyksiin ja antaa neuvoja siitä, mitä nähdä ja tehdä (ja ei) kaupungin". Haluamme heidän suosittu, erittäin kiitosta kävelykierroksia ja pub ryömii. He eivät \ 't hyväksyn vierasta alle 18. Loved it! Staff was really good and friendly, the room I stayed in (12 pers dorm) was okey and the lounges were awesome. Fun activities in the evenings and really good location ! I absolutely loved my stay in Castle Rock Hostel! Definitely the best hostel I’ve ever stayed in, I have absolutely no complaints at all. Beautiful and spacious hostel on a very central spot with lots to do. 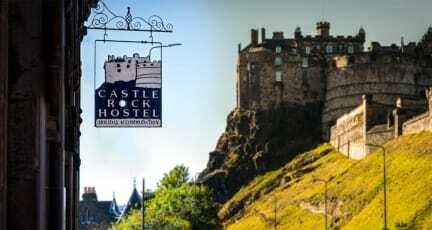 This hostel is located in the heart of Edinburgh, just next to the castle. Friendly staff, cheap prices and good night time activities provided by the hostel. The hostel also has good kitchen areas, movie room, music room and the main lounge where people like to spend time - perfect for outgoing travelers. This was my first stay at a hostel and my experience couldn't have been better! We stayed only one night with my sister it was first time staying at the hostel for both of us. The hostel was near every tourist attractions you need to see in Edinburgh. Staff is very welcoming and friendly. Rooms and beds were clean, as were the showers and toilets also. Public spaces are colourful and funky and there was space for everyone in different rooms. We signed up for Saturdays' beer pong which was a lot of fun! Highly recommended! Thank you! It was my second stay at this hostel, and I would stay there again if I ever return to Edinburgh. The place is really clean, the location is good and all the staff members I met were really nice! The building is beautiful as well, I wish I could have stayed longer. Todella kiva paikka hienolla paikalla (heti linnan vieressä). Henkilökunta oli hyvin avuliasta ja hyvällä meiningillä mukana toiminnassa. todella siisti ja hyvin hoidettu hostelliksi. Vaikka iltasin on mahdollisuus osallistua beer bongiin tai esim pub grawliin yöt olivat rauhallisia ja sai nukkua rauhassa ilman sen suurempia häiriöitä, vaikka ei haluaisikaan osallistua toimintaan. voin suositella hyvin lämpimästi! This is a great hostel! Couldn't have any complaints. I stayed in the 16 bed mixed dorm and there were no problems. It is right outside the Edinburgh Castle, it is clean and has a great atmosphere. Wonderful stay. The rooms are great, lots of space, convenient lockers. Noisy dining room to meet people, quiet lounges for reading etc. Staff is super friendly. Showers and toilets are OK clean, and there are plenty of them. The house itself is cool. One thing I always miss in hostels is a table or any kind of level in the bathroom, where you can put down your toilet bag and stuff.